Olive decides, on returning from Thórsmork, that she will travel around Snaefellsnes and to Akureyri. The distance will be three to four hundred miles and will probably take about three weeks. 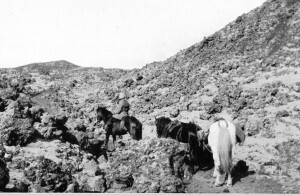 Quite the trip for a woman traveling alone on horse back in 1929. She prepares for the trip by sending her luggage by sea on a mail boat to Akureyri. She takes two haversacks and includes in them all her sketching materials. Her friend, Stefán, discovers that the Sudurland, a small cargo boat will be going to Stapi. There is a farm there where Olive can stay overnight before riding to Búdir. She will have a guide and three horses to take her from Búdir round Snaefells Jökull to Stykkishólmur. That part of the trip will take five days. In the early morning the ship anchors off the creek at Stapi. “One had either to jump or be lifted into the boat from off the iron steps down the side of the Sudurland. Olive’s haversacks get thrown into the boat and one of the boatmen carries her. “At last we were all wedged safely in between a mail bag, a lot of sacks, and some timber that had been taken off the “Sudurland”. “At eight o’clock we all sat down to coffee and cakes, after which I tried to get some sleep on my sofa, but this was out of the question, for the farm at Stapi, like so many of these primitive and isolated little homesteads, is the proud possessor of a telephone. It was constantly ringing, and either the farmer, his wife, or one of the other women, and occasionally all of them together, would hasten to answer it, continually repeated: “Ullo! Ullo!Ullo!” sometimes for as long as five minutes on end. It is 1929. How Iceland has changed. Olive often travels in trucks or cars for part of her journey. The roads are primitive, full of pot holes and rocks, sometimes no more than a dried creek bed, but there are roads. People and goods are moved more easily and quickly. Horses are being displaced and the change can be seen clearly when Olive reports that horses are frightened by motor vehicles. Before, there was nothing to frighten the horses. Symbolically, the horses being frightened by the vehicles presages the near future in which these vehicles will replace the horses, taking away their essential part of Icelandic life. Now, there are telephones. Telephones that change life in Iceland dramatically for isolation was an essential part of Icelandic life. The farms were far apart, the weather, harsh, traveling conditions extremely difficult and dangerous but now there were telephones. No wonder the farmer’s wife and his daughters jump up and run to the phone every time it rings. Although Olive is simply recounting her travels around Iceland in the year 1929, she is, inadvertently, recording profound changes in Icelandic life. The very foundations of Icelandic society as changing. This entry was posted in Uncategorized and tagged 1929, Across Iceland, Olive Murray Chapman, Reykjavik, Stapi, Sudurland, telephone, Thórsmörk by william. Bookmark the permalink.